Their collection of digitized parish books. Their collection of another digitized materials, that is different for each district archive. Their collection of digitized maps of estates. I strongly suggest you to bookmark all the main links that will be mentioned in next paragraphs, because the website of Zámrsk is not very intuitive even for Czech users. 1. 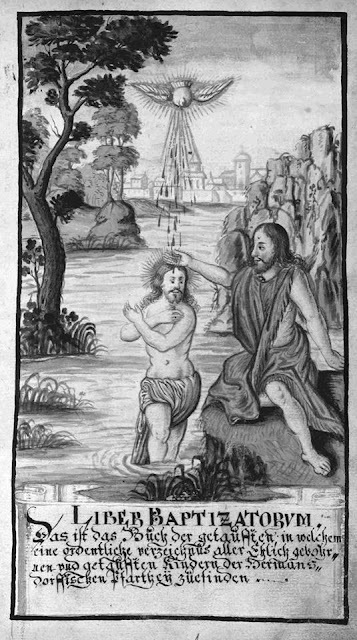 Collection of digitized parish books. You can find it here. Use this link, because the inventory list is cca. three times a year updated, so if you bookmark direct link to the .pdf file, it might stop working during time. You can also download the file, but keep in mind the chance for updates - each update will be also announced in our Czech Genealogy group. WWII Civil offices (from the page 2574). Each book has number of order in the inventory, that might change when there is a new book added, and a signature, that is stable and identifies the book. The order of books for one parish starts from oldest books, that are often for baptism, marriages and burials together; newer books are listed in this order: baptisms (if there are different books for each village, they keep the time frame from older to newer books for one village, then the same for another one), marriages, burials; index - there might be three basic types: baptisms, marriages and burials for whole parish, maybe in more volumes; or baptisms, marriages and burials for each village (or a group of them); or index for baptisms of whole parish, of marriages for the whole parish, for burials for the whole parish. Sometimes there are indexes included in the parish books. Parish district: here are listed all villages that were in the parish during time and sometimes also villages that were not part of the parish officially, but books contain their records for whatever reason - it's often explained in text also with time frame. In brackets there is a German name of the village (or the most common/official form, there might be differences in particular records), previous Czech names of the village, previous and current jurisdiction, district). There might be also a note that the village was or is in another parish. Note: basic info about the important historical dates of the parish: in this case 1353 was build (or mentioned) a parish church, that was later a subsidiary church of the parish of Šonov, 1783 there was a "lokálie" - the church and its own priest, but still under "jurisdiction" different parish (but with its own books), 1862 parish of The Order of St. Benedict in Broumov. Type of a parish: confession; Vicariate: the church that was somehow superior to this one; Diocese: in this case Hradec Králové; Matricular district: current office for the mentioned villages - there could be more of them; District: current district; Region: current region. What we see here is a list of parish books of different kinds. The first number means the number of the book in the list (it's the same as the number after "ukn") and can change. Sign. number is a number of signature for each book, this is a unique number that is stable and if you keep track of sources you used (which is I hope a basic thing for a researcher), this is the number you need to write down. In the last book's entry, you can see index NOZ and it means of course BMD index. The content of index might vary but since you know what the letters mean you can understand, now. Time frame of the book is comprehensible. Then there is ukn number - the number of the book from the order of books in this list. Územní rozsah means the area covered by the book records. If there is the word farnost it means the book contains whole parish. If there are certain villages, they are mostly followed by time frame in brackets, so you can easily see, whether the date you need is in the book. The longest part is a description of the book in the formal way: there is its size, type of a binding, total page count (fol. means folio), language (němčina, čeština, latina - German, Czech, Latin), note about various content aside the BMD records - in these cases there are drawings in the books and some church summaries and another entries. Mikrofilm č. number is a number of a microfilm. And finally there is a link where you can download the whole book. If the link is missing, the book is not digitized yet. 2. Collection of another digitized materials. There is also a page that leads to e-badatelna (badatelna means research room) for each of district archives that are united under Zámrsk as a regional archive. Unfortunately, there are various sources digitized in each district archive, if any at all. for some of the villages and towns there are also digitized chronicles (pamětní kniha), but it's the same as for censuses - some of them were removed because of GDPR. 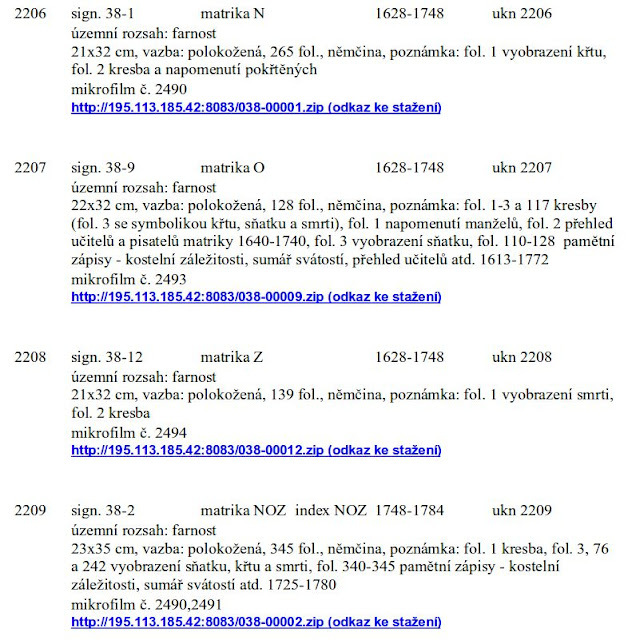 there are also another materials, like medieval charters in case of Hradec Králové. under Místa a regiony were published various materials, but they are all removed because of GDPR, but with promise of bringing back the ones that are not protected by this law. chronicles and charters. Only materials older than 1945, because of GDPR. 3. Collection of digitized maps of estates. Various kinds of maps, not only of estates, but also of hunting grounds, forests, pheasantries, ponds, rivers, roads, church lots, stabile cadaster maps and maybe more. Search is the same as in the inventory, use ctrl+f and name of the locality, then copy the link and see the map. If you don't want to download whole .zip files of parish books from inventory, you can always try, whether the same book isn't available on FamilySearch. I think there is quite a huge time gap in updating files on FS in case of books of newer inventories, but it's worth trying. How can you reach the book? There is some kind of search form, but I don't use it, so I will omit it :) But you could certainly try search at least in the Catalogue part of FS, that might give you results that are not on the list mentioned in the following text. Now there is the weirdest part - you have to choose the book you need. As I found out, the numbers in brackets often don't mean nothing. What I do is that I find the book in the inventory and try to find the same time frame. If there are more of them, check the second image, there is a description of the book similar to the one in the inventory. If there is no description of the book, it's very possibly a continuing part of the previous book on the FamilySearch list (somehow certain bigger books are devided into more parts without warning). Sometimes there are indexes listed as the parish books, not as indexes. If you know from the inventory list, that the index exists, try to locate it. There are also censuses from Zámrsk - of course not all of them, but as I mentioned above, in some cases there are the 1921 ones that are removed from Zámrsk website. There are also some of them (e.g. from Chrudim district), that can be reached via FS Catalogue, but are not mentioned in the list of available censuses. Start on the same main page as for parish books, but choose censuses. Then you choose the district (you can follow the list of district archives under part 2 of this blogpost. There are not many villages, nor all years for them, but still you might be lucky and find the one you need (this is against one of the Murphy's Laws for Genealogists - if the source you might need is available, the part you need is missing -, but maybe you are the exception proving the rule :D ).Sometimes there might be censuses from districts of Zámrsk under nearby districts of different archives (I think there are some villages from the South of Svitavy district under Prostějov, but I cannot name even one :D ). Thank for posting this, very helpful! Excellent article! I had figured some of this out, but not all. thanks very much!